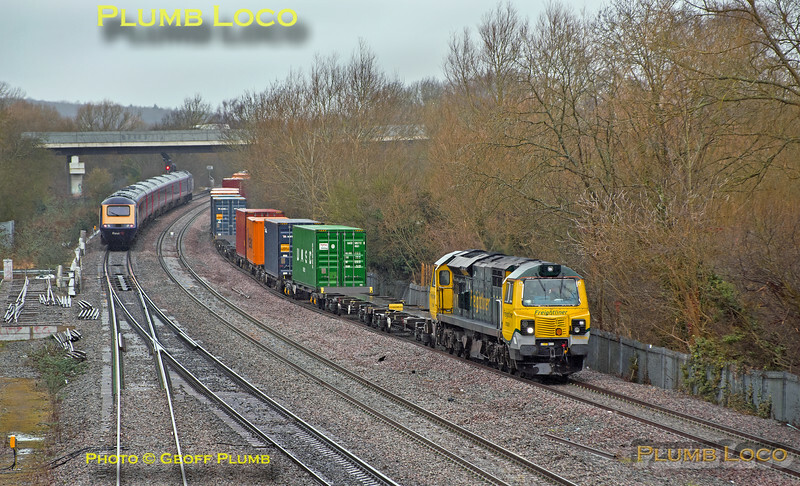 Freightliner 70006 is running along the Up Passenger Loop from Wolvercote Junction towards Oxford North Junction at the head of 4O27, the 05:21 from Garston to Southmpton, running on time at 10:31¾ on Saturday 10th February 2018. An unidentified GWR HST is waiting for the road to take the Worcester line with 1W21, the 09:22 from Paddington, delayed by the late-running 1P37, the 08:43 from Great Malvern to Paddington, which in turn delayed the steam-hauled special to Worcester. Digital Image No. IGMP33711.